By 2019, here at Third Space Learning we will have taught over 521,000 Maths lessons 1-to-1 to 45,000 Year 6 pupils in 1,670 different UK schools to prepare those pupils for their KS2 SATs. As such, we feel we’re quite the KS2 Maths SATs Intervention experts! 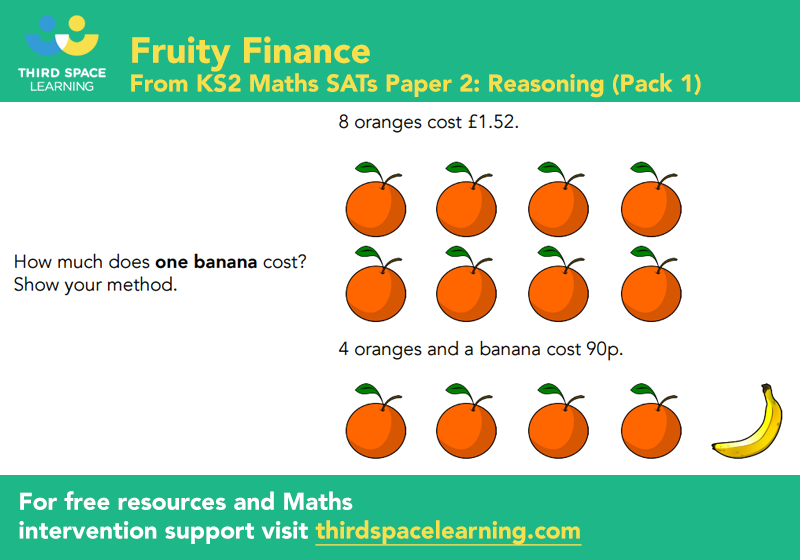 Unsurprisingly this makes us the largest provider of 1-to-1 Maths tuition for SATs in the country, and so in a unique position to understand what really works for Year 6 pupils to achieve success from a KS2 Maths SATs intervention. Teaching 6,000 pupils in 1-to-1 lessons every week, getting to know them, understanding their different misconceptions in Maths, working out how we can best plug their learning gaps or deepen and extend their understanding, we’ve learnt a lot. So here are the five key ingredients we think your SATs interventions – in fact every SATs intervention – should have, and insights we hope will be useful when preparing your pupils for the KS2 National Assessments, this year or next. One of the best ways to prepare your pupils for any assessment is to make sure that they’re familiar with the types of questions they’ll be asked, and the different ways that they can be asked them in an exam. 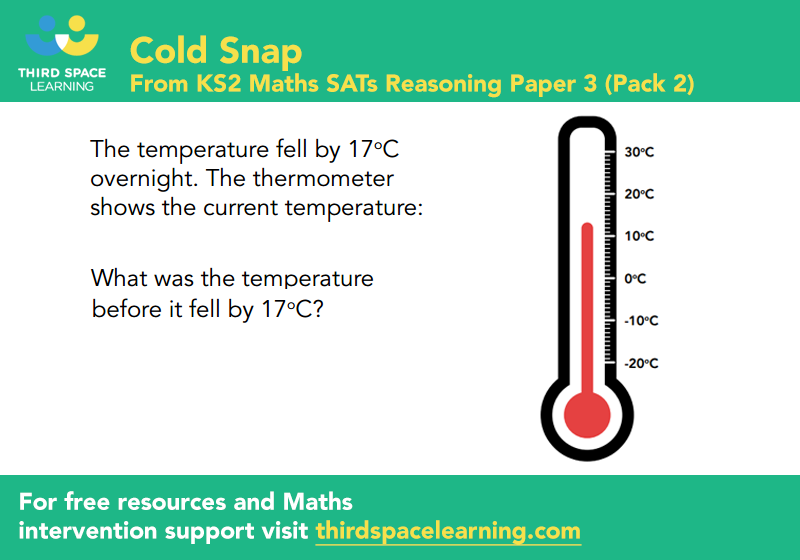 For many schools, this means using SATs questions and practice papers as an assessment tool, but we would also recommend using SATs papers (such as this Arithmetic and Reasoning SATs Pack of 3) as a teaching tool. By including SATs-style questions in the classroom environment – and outside of exam settings – pupils can discuss and verbalise their answers, becoming more comfortable with exam terminology. Moreover, using SATs-style questions as a teaching tool helps to normalise the work pupils will undertake during an exam, which will boost their confidence. You can incorporate SATs questions into your lessons in all sorts of ways, whether as bell tasks, starters, or extension tasks. Try question from a practice SATs paper as a starter for your lessons several times a week and pupils won’t bat an eye when faced with the trickier reasoning questions come SATs week. 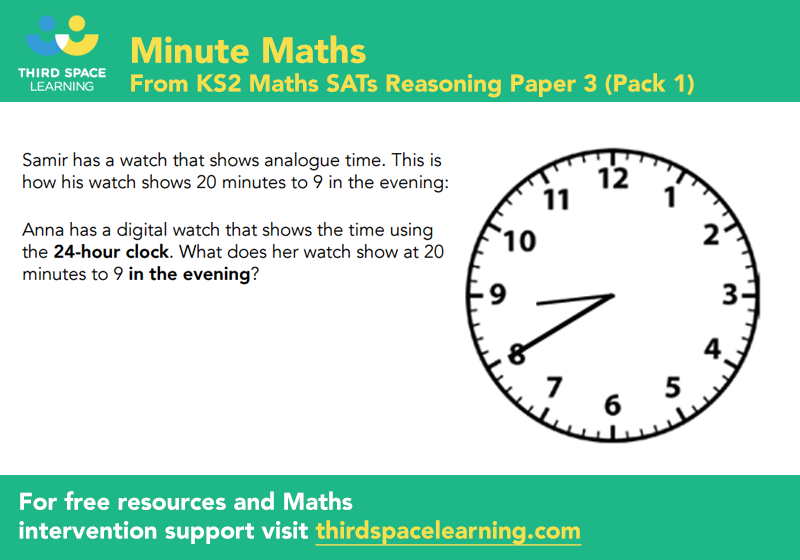 To make it easy for you to start this off you can use the images below – taken from the SATs practice papers in our Free Online Maths Hub – and try it out for a few days (simply click the images to open in a new tab, and print them off). If you do, let us know how you get on at @thirdspacetweet. This style of learning mirrors our 1-to-1 interventions, where pupils and tutors work through SATs-style questions together. As they do, pupils are encouraged to explain their calculations. Tutors are then able to correct any faulty reasoning, whilst pupils improve their verbal reasoning with numerical concepts. Often pupils come to us with good procedural knowledge but they struggle with problem solving or reasoning skills. In the run up to SATs, it can be tempting to focus mainly on plugging any gaps in procedural understanding but, actually including problem solving tasks in your SATs preparation for all pupils helps to develop their reasoning skills and work independently in a more effective way. Our tutors make sure that all of our SATs lessons contain a range of problem solving questions, even in lessons for pupils working below expectations. 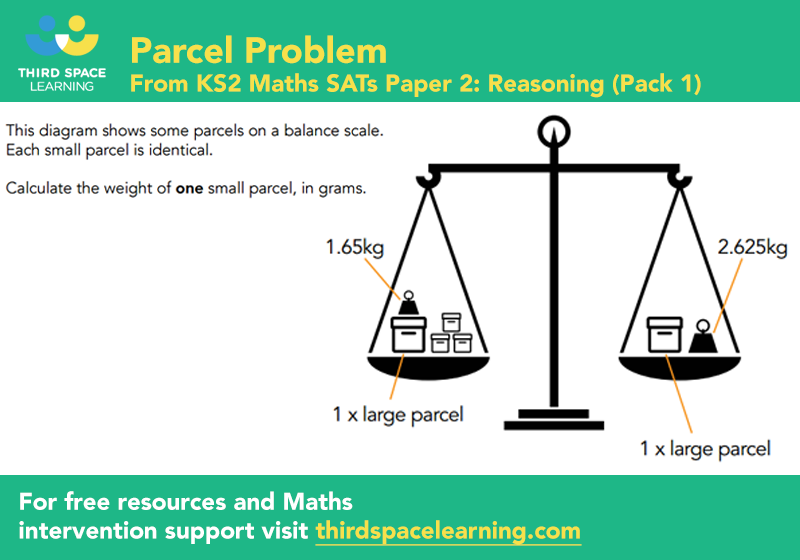 If you want to integrate more problem solving into your classroom, you can download our free resources such as this KS2 Topical Maths Reasoning Investigations for Summer Term 1, or the Ultimate Guide to Problem Solving Techniques. Getting pupils to explain their numerical reasoning not only helps to deepen their understanding but ensures better information retention. Third Space tutors regularly ask pupils to explain what they’re doing and why. They’ll use questions such as ‘how do you know’ ‘are you sure’ and ‘can you imagine’, the latter in particular helps to move them along to the more conceptual, deeper lines of thinking that are required for independent work and assessment. To extend the learning they might swap roles, and get the pupil to teach the concept back to the tutor. Here are 9 questioning strategies to improve your pupils’ understaning of key concepts in Maths. You could also introduce a more rigorous questioning approach elsewhere in the school. For example if your TA is conducting an intervention with your pupil, providing them with a list of questions such as those provided in this Growth Mindset Questions resource can work wonders in the long run! Growth mindset is really important in Maths because it’s a subject where confidence can really affect their learning. Just thinking a bit about what how you give feedback little le phrases like “you worked really hard on that!” or “I like how you persevered with that question” rather than rather than “you’re so good at maths” can make a big difference. At Third Space, our tutors are trained to support pupils to develop a growth mindset. Tutors make a point however of not just praising effort but also following up with next steps or corrections where a pupil does need to try again. The tutor and pupil will evaluate mistakes together and the tutor can then help them to try a different strategy. Again, the list in the Growth Mindset Questions resource is very usefu.! The most effective interventions are those that are highly personalised to the needs of the pupil. This means teaching directly to a pupil’s own misconceptions, adapting the lesson, and extending it as appropriate for the child. Of course, you will have a good idea of a pupil’s strengths and challenges in Maths, but to really drill down into the detail of where their gaps lie, diagnostic assessment can be a really useful tool. Pupils on Third Space Learning’s 1-to-1 intervention programme sit down to a diagnostic test before their first session which helps inform the sessions their tutor will teach, and at what level that session should be pitched. Plus, during the lesson, tutors use AFL (assessment for learning techniques) to vary the pace according to how the pupils are responding. Of course, all of the above isn’t just about preparing for SATs. Learning should prepare pupils for the real world just as much as SATs. Promoting growth mindset, improving reasoning, and building problem solving skills won’t just help them get the best grades possible in their National Assessments, it’ll help them become vibrant learners ready to face any challenge the world can throw at them! The best way to find out more about Third Space Learning interventions is to visit our website, where you can book a demo to see a lesson and understand whether we could help your target pupils get their Year 6 journey off to the best possible start in September. Or conduct a quick health check of your school’s Maths interventions with our Free SLT Checklist that’ll save you time, resources and expensive mistakes.